Denver, CO -- You’d think there’d be a mellowing out of picky eaters later in life. Personally, my taste has mellowed since youth and I am now able to let foods touch each other on my plate, as well as consume both cooked mushrooms AND cooked onions. I will, however, never like mustard or horseradish. One of the very first things people need help with as they get older is shopping, which happens to be one of the most personalized chores around. Cleaning a bathroom or helping someone with a shower might actually be easier. Part of it is that we’re used to doing our own thing, putting exactly what we like and exactly how much in our baskets. Most of us wouldn’t think of buying something we don’t like -- why would you spend money on something you don’t want? So when our personal shopper comes home with things that don’t perfectly match our grocery list we A.) view it as a waste of money and get a little crabby, plus B.) worry about wasting the food which we’re sure we might not like. Dad wants unsliced bagels because when they slice them, there’s still that middle part which tears a piece out of either the top or bottom and then there are holes. To him, frozen Annie’s Breakfast Burritos are about a C- in quality, but they are handy to have around so he asked me to buy a few after we discussed burrito grading. He likes those spanakopita appetizers but there are too many in a package (12) and he has to repackage them in baggies with 6 each. 6 is perfect (insert long conversation about why they don’t make packages of 6). I find myself reaching all the way to the back of the orange juice jugs (pulp-free) to find the ones with the latest expiration date. I’m supposed to buy Hunts (or is it generic brand?….OHHHH NOOOOO) diced tomatoes with oregano which are great because Dad can get three servings from a can. Not sure what the oregano has to do with it but he still has plenty of these. He likes the pre-cooked link sausage better than patties because the link sausages take up the right amount of space on his plate and he can stick a fork in the end and lift the whole thing up to his mouth without cutting it. He recognizes this is an odd trait and guesses it is some kind of personal idiosyncrasy. I have to find Dad some kind of salad to go with the (6) spanakopita appetizers and wine (not beer because wine goes better with these and he really doesn't drink much beer anymore) and not necessarily a lettuce salad like last time but just anything else even if it is a little creamy which he’s compromising on because he’s given up on non-creamy coleslaw. He's not going to eat the spanakopita or drink the beer until the salad problem is solved. 1. If possible, bring the person with you the first time you go shopping for them. 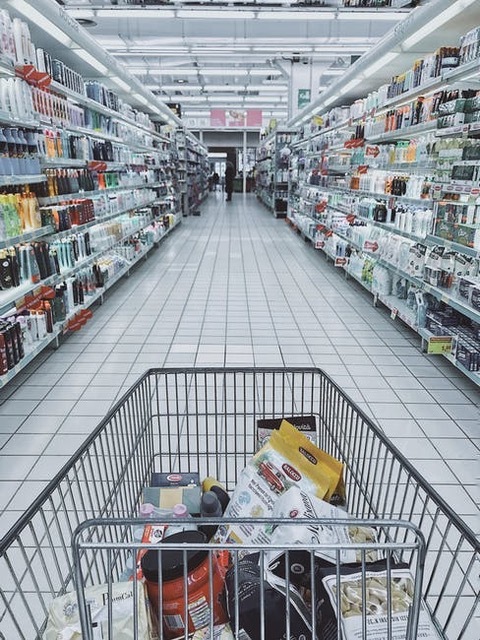 Even if they have to use the electric shopping cart and almost take out half the pickle aisle, you’ll have both the visual of the items as well as the muscle memory of their choices around the store. 2. Ask the person to keep an ongoing grocery list AND save some part of the packaging for items they need more of. Even saving the top of a macaroni and cheese box or part of an egg carton can save you from trying to guess which brands someone is used to. Speaking of packaging, also keep an eye out for items that may be hard to open alone (pickle jars?) and ask the person if they want help opening those before you leave. 3. If the person you’re shopping for doesn’t live with you (and sometimes even if they do), consider whether or not you’re going to keep your finances separate. If you’re going to pay for all the groceries together, make sure that the arrangement is clear about who is paying for what or how you will be paid back. Mostly, combining bills can get messy down the road when it comes to explaining to siblings how you’re getting reimbursed or even showing for Medicaid eligibility that someone’s money was actually spent on them. Finally, snap a picture or save a few grocery lists so that, down the road if your loved one is under the weather and can’t write a list, you have something to go off of. Plus, if they are hand-written, these can be sweet to use as bookmarks in your cookbooks for a smile down the road. I still have a photo of my friend’s grocery list in her handwriting that seems to say “tractor”. It took us forever to figure out that it said, “thermometer” -- which was needed because she used the old one on the cat.